SAN DIEGO – January 16, 2015 – The 2015 Suja Rock ‘n’ Roll San Diego Marathon & ½ Marathon will for the first time feature a Rock ‘n’ Roll 5K on Saturday of race weekend, part of what’s dubbed the Remix Challenge. Runners who complete the 5K, plus the half-marathon, marathon or half-marathon relay on Sunday will receive a medal for each race, plus a special Remix Challenge medal. The 5K will be on Saturday, May 30. The marathon, half marathon and half-marathon relay will be held Sunday, May 31. The 5K, which will start at 7 a.m., is expected to draw 3,000 participants. The first 500 entrants receive a special presale registration price of $35. Like its big brother, the Suja Rock ‘n’ Roll San Diego Marathon, the 5K will begin in Balboa Park, a short jog from the marathon start. The predominantly flat course will take runners down 6th Avenue toward Hillcrest, then loop back to Balboa Park. With its museums, Spanish architecture, flowers plus wide expanses of green grass and tall trees, the 1,200-acre Balboa Park is a San Diego cultural treasure. The park celebrates its 100th anniversary in 2015. Balboa Park is also vital to San Diego’s running history. The San Diego Track Club has based workouts there for decades. Famous runners like San Diego High graduate Meb Keflezighi have trained in the trails that meander around the park. Keflezighi will be in attendance at the 5K, greeting runners. And Balboa Park was the site of the Rock ‘n’ Roll Marathon brand’s birth in 1998. Runners have long valued the creative, colorful and stylish medals at Rock ‘n’ Roll Marathon events. The Remix Challenge medal will continue that trend featuring a spinning guitar pick.As part of a brand that has focused on making running fun, featuring bands, cheerleaders and concerts, the new 5k will include entertainment along the course and finish line festival. For more information or to register for the Remix Challenge, visit RunRocknRoll.com/San-Diego. Organized by Competitor Group, the 18th annual Suja Rock ‘n’ Roll San Diego Marathon & ½ Marathon to benefit the Leukemia & Lymphoma Society will run through San Diego over the weekend of May 29-31. The race is known for lining the course live bands and cheerleaders interspersed with themed water stations along each mile of the route. The original Rock ‘n’ Roll Marathon in 1998 is still recognized as the largest inaugural marathon in U.S. history with 19,979 entrants. A free two-day Health & Fitness Expo at the San Diego Convention Center kicks off race weekend, featuring more than 80 fitness retailers, exhibits, free samples and interactive clinics. The event concludes Sunday afternoon with a finish line celebration and headliner concert at PETCO Park. Over the 18-year history of the race, runners participating with Team In Training have raised more than $176 million in San Diego to support The Leukemia & Lymphoma Society’s (LLS) blood cancer research and patient services. 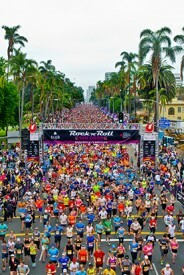 For more information about the Suja Rock ‘n’ Roll San Diego, please visit RunRocknRoll.com.